The two rooms of the b & b Beatitudinem have been furnished with the taste of the romantic. 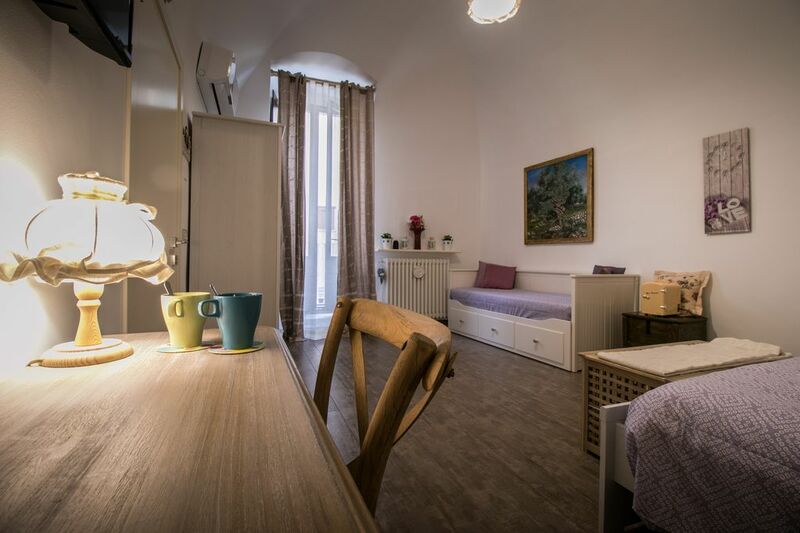 Beatitudinem is located on the first floor of a characteristic of the early '900 house located about ten meters from the Municipal Palace and the beautiful Teatro Rossini. The strength of this structure is the fact of being the crossroads of many attractions: Bari, Matera, Alberobello and the Ionian coast. The current town of Gioia del Colle was born around a castle of Byzantine origins. Its name derives from Joha, reduction Joannakis surname, Byzantine family present in these places in the Middle Ages, but the origin of the name there are many opinions and even legends. One of the most famous is that according to a noble woman traveling in lost jewels of the area including a beautiful and valuable necklace. At the place where the necklace was found he was given the name "Gioia del Colle." The complex and original history of the city of Gioia del Colle is also illustrated in its particular heraldic coat of arms: a glass-shaped cup filled with jewels and bordered by agricultural motifs. Unlike the crests of the neighboring countries, that of Gioia del Colle, which dates back to 1934, does not bind to any symbols representing families, marquisates or ducats, but tells the presence of a heterogeneous civilizations ranging from poverty to wealth, from crafts to large estates . It is inspired by a sculpture created in 1480 by Joannes de Rocca, on a walled stone at the site of the University of Joy, depicting three coats of arms: that of Joy with the inscription Universitas Joe, the Aragonese with the royal crown and the one of the Acquaviva Conversano. The town was rebuilt by the Norman Riccardo Siniscalco, only to be destroyed by William I of Sicily called "the Bad". It was re-founded in 1230 by Frederick II of Swabia to return from the Crusade. It seems that the castle was a residence where he stopped during his hunting trips. It was then completed by the Anjou who opened the windows on the screen. Between 1600 and 1800 the successive owners (Acquaviva d'Aragona, De Mari, and Donna Maria Emanuela Caracciolo) completely removed the appearance of a fortified residence. According Bonaventura da Lama (thesis shooting from the historic Pantaleo) in this castle was locked Bianca Lancia during pregnancy of Manfredi of Sicily on suspicion of having betrayed Federico II. On the wall of a cell (in which most probably has been locked the princess) are, in fact, sculpted forms that according to the legend should represent the breasts that Bianca Lancia cut off from the pain of such a humiliation. After giving birth she sent on a silver platter to Frederick the alleged illegitimate son with his sinuses. Others say this is just a legend: Bianca Lancia asked to legitimize children born during their relationship with a regular marriage shortly before his death. Still others say that it was Frederick II to die after marriage. The "new" city, however, would have originated from a much more ancient settlement: Monte Sannace, located about 5 km from the town today. Archaeological excavations, even today, bringing to light the remains of a village of Peucezi dating from the seventh century. C. Joy was born during the Byzantine rule and then passed under Norman rule, it enfeoffed to conte Riccardo of Hauteville. A Frederick II was responsible for the reconstruction of the castle. It was the principality of Taranto and feud of the De Mari principles of Acquaviva delle Fonti until the abolition of feudalism. The Norman-Swabian Castle of Gioia del Colle is the result of at least three construction operations: one dating back to the Byzantine period, another in the Norman and the last to the Swabian. Initially consisted of a fortified enclosure in stone quoins, was enlarged in the twelfth century by the Norman Riccardo Siniscalco, who turned it into a stately home. The final arrangement of the castle is due to Frederick II around 1230, a period in which they are presented with a quadrangle, halls and rooms that overlook on it, and is bordered by four corner towers. Of the four original corner towers, which is discussed nell'apprezzo of Joy Earth is the architect and tabularium Honofrio Tangho of 1640 that Gennaro Pinto of 1653, today there are only two: the De 'Rossi and the Empress. The castle permanently houses the National Archaeological Museum of Gioia del Colle. Recently we were filmed scenes of major motion pictures and rewarded as "Tale of Tales" by Matteo Garrone in Italian translates as "The Tale of Tales". Built in the late eleventh century by Riccardo Siniscalco as "Palatine Church of St. Peter ", was originally dedicated to St. Peter, it was renamed Our Lady of the Snow." The church was destroyed in 1764 by a fire set during a popular uprising. In the same year the church was rebuilt and devoted to the nativity of the Blessed Virgin. In this era date back two stone sculptures (S. Filippo Neri and the Madonna with Child's Womb) on the facade.